The LX is Pentax’s most advanced manual focus camera. To begin with, it supports just about every imaginable “pro” feature of its time: mechanical construction, support for fully mechanical operation, extreme reliability and durability, DOF preview, MLU, TTL flash, interchangeable screens, a large system of accessories, etc. But the LX stands out (even by today’s standards) as it also features interchangeable viewfinders, a light meter with extreme low-light sensitivity, off-the-film metering (OTF) for ambient exposures, and dust- and moisture-proof seals on every button and dial. Because of the OTF metering, no exposure adjustment is needed when a different screen or viewfinder is in use, and no viewfinder blind is necessary for long exposures. These advantages paired together with the sophisticated metering turn the LX into the preferred camera for a large variety of applications. For example, the LX is capable of taking extremely long metered exposures and achieving correct exposure even if the lighting conditions change during the exposure. The body is the center of an elaborate photographic system that features interchangeable viewfinders, motors, winders, grips, etc. Exposure compensation is in 1/3 EV steps, and there is an optical aperture readout in the viewfinder. 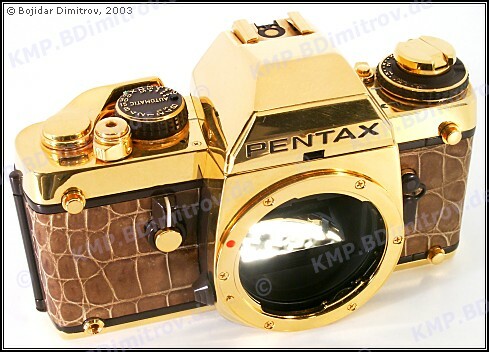 The gold LX is a special edition body commemorating the 10 millionth Pentax SLR camera. Only three hundred of these 24-carat gold-plated units were manufactured. Each one was sold in a set with the gold SMC 50/1.2 Gold lens. Virtually no other camera has ever offered so much flexibility, robustness, and low-light capabilities in such a small and light package. Add the silky-smooth operation of every button and each lever and the astonishing system of accessories, and you get a masterpiece. But an unfinished one. 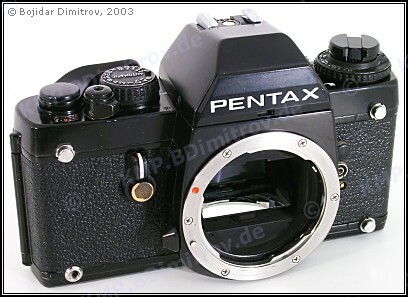 The biggest problem with the LX is that Pentax never introduced a successor for it — a camera built on the same principles but with modern features and improved components. For example, they could have added a spot meter, even if this is difficult to integrate in the OTF metering system. They could have made the complex shutter quieter and faster, or they could have found a way to allow concurrent use of MLU and the self-timer. Another problem with the LX is that it is no longer in production, and parts for it are difficult to find. It usually takes at least 10 to 15 years before the first problems come, but when they come, professional care is needed. And professionals trained to repair the LX are difficult to find, and their work is expensive. The most common LX problem is the so-called “sticky mirror” where, after periods of inactivity, the mirror “hesitates” on its first trip up towards the viewfinder. This is normally accompanied by the “no infinity focus” syndrome where wide-angle lenses cannot be focused at infinity. Both problems are caused by a small rubber piece onto which the mirror rests in its “down” position. Due to aging, this rubber piece becomes porous and sticky, and the mirror sits lower and becomes stuck to it. This rubber piece is easy to reach and replace, but when that happens, it is usually time for a complete service. There are several other mechanisms deep into the camera that need cleaning, lubrication and adjustment (CLA).